The Stonewall Jackson Area Coucnil relies on donor support to operate. Friends of Scouting provides general support to our organization. Donors can also choose to support a Scout who has financial needs or give to our endowment. Endowment support allows your gift to be invested and only the earnings be spent to to support our mission. Enowment gifts are considered permanently restricted when giving through this platform. We serve 2,500 youth in central and western VA and WV. All gifts are tax deductible to fullest extent of the law, consult your tax advisor. 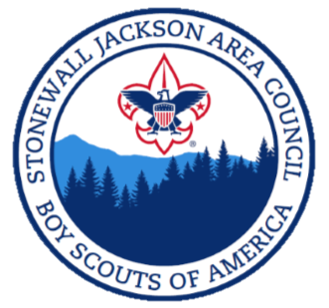 The Stonewall Jackson Area Council is a 501 c 3 charitable organization. The Stonewall Jackson Area Council now has the ability to let you make a recurring gift, where we will charge your credit card automatically on the 1st or 15th of the month, or the first buisiness day thereafter. If you are interested in setting up a recurring pledge via credit card or through invoicing be sure to select the appropriate option.